Join us for a delicious dinner and drinks and get in touch with the happy bunch of our CNS teachers, some of our CNS families and their kiddos during our non-profit fundraiser night at Elsmere BBQ & Wood Grill in their new Portland location on 476 Stevens Avenue in Portland! Besides BBQ type food, they have a variety of vegetarian and vegan meals as well! The newest Elsmere restaurant has been mentioned as the new hot spot in the Deering Center neighborhood. Come and check it (and us) out this coming Tuesday, November 13th! A portion of the proceeds between 4 and 9pm will directly benefit the continuous existence of our school! We have a very talented group of CNS families and are very thankful for the beautiful things our parents are able to do for our school, like the poster below, which has been designed by a CNS parent and local artist Michael C.
Click on the poster and a link will send you to our Facebook event where you can RSVP and where we post the most current event updates. December 8, 10 am – 2 pm. Join us for the 43rd annual Grand Bazaar and Silent Auction! entertainers, face painting, lots of children’s activities, and plenty of delicious, local food. Sparks’ Ark performs at 1:00 pm. Sweetums the clown – balloons animals and fun clowning. Local artist Michael Connor – drawing with kids. This event is free, with a variety of food and great items for sale and auction. 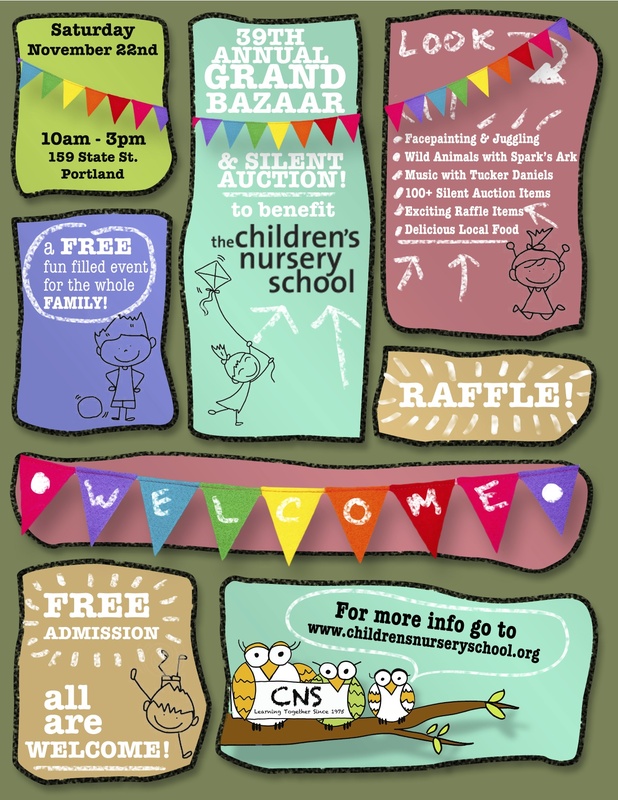 All proceeds benefit The Children’s Nursery School directly; a parent run, NAEYC accredited preschool in the heart of Portland’s West End. The Grand Bazaar was a huge success. Thank you to all of our sponsors and donors! Entertainment will include: Matiss Duhon the juggler, Spark’s Ark live animal show, and music by Tucker Daniels.